Some of you remember that I had bought some yarn a week or so ago and couldn't find a pattern that looked right with the colors I wanted to use. I finally found one that i liked, and it works up really quickly and is such a simple, yet pretty, pattern. 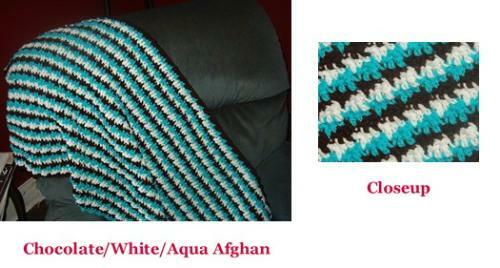 Here's a picture what I've done with the chocolate/aqua/white yarn. I've already started another too, and found more colors that I want to use this pattern for. I think it's going to be a hit. What are you working on? the colors of the thread you bought are really cool colors. very soft for the eyes. i think my frustrations in the craft world is to to something with yarn. i always end up doing it so tight and not finishing it up because of frustration. i am most on cross stitch and basket making out of news papers. i hope one day i can perfect something that has to use yarn. have a blessed weekend. Baskets from newspapers? Now that sounds interesting! Do you have pictures of what you've done? Or a link where I can learn more? i make baskets from news paper before christmas. then i put some goodies inside and give it to my friends. i dont have any samples here but promise to show you one when i make one already. i will right the procedures first so if i type it it will not be confusing. for sometimes i do get excited then my message is all confusing. yes, i promise i will show you a sample. yes it is not easy to weave it and when i did it the first time it was not that good. i cant even put a handle at the basket. but practise makes perfect and i think i am good with it as years goes by. i started making baskets at around 1994 and i was having fun with it so i made it yearly. i only make small ones and every christmas my friends are all waiting for the baskets.... lol. That is very pretty you are quite handy with a yarn and needle. Those are pretty colors. I wish I had talent like that. The patterns I choose are very simple, really. I try to vary them with use of color. So far I haven't done one that I didn't like! Nothing that has to do with yarn so you've got me there. We are packing to move to Houston, TX the second week of October. I don't envy you packing and moving, been there/done that more times than I care to count, and it isn't over yet. I'll be moving again with 2-3 months myself. Maybe we'll pass each other on the highway. No, I'll be going from OH to NC, so I don't think we'll cross paths. Have a safe journey. That's my Mom's favorite pattern for afghans!!! Can you see it close enough to really tell? This is a first for me, but I really do like it and I think it will be added to my list of favorites. Very simple, but with just enough variation in the stitches that it doesn't look too boring. That is gorgeous. Can you make me one? I love the colors it just totally all comes together. I cannot knit for the love of me so I don't even try. I have never actually been taught either so I guess that is why I never got into it. One of my aunts use to live with us and she would knit all the time and I was just fascinated with it but she never taught me. Awesome afghan and remember I want one too. I do sell them, so if you're serious, give me a holler. I really do like that pattern, but I wouldn't want to finish off all those ends. IF I was doing it, I'd make the stripes run longwise and the ends would be fringe. I'm not doing any thing with crochet. After making 5 different beaded bells, I think I've come up with a pattern that I like that works. Now if I could only get it to print. For some reason there's one size bead that doesn't show up at all in the printed page, so I'm going to have to go back and redo the whole thing, because I can't find any kind of hidden code that keeps that from printing. I thought about fringe too, but the width between the ends isn't the same. One row ends in treble crochet and the next ends in single, so at one point they are close together and then further apart. I even thought about tying two or three together, but it doesn't come out right that way either. I just looked at your bell on your blog. Very nice! Wow, it's beautiful. I am working on a blanket myself. I am just doing a solid color though. How long did it take you to get that much done? Just a few days. This pattern works up very fast, although there is only one row per color, so finishing off the ends will take a while. That is really nice, a really nice pattern. I am still working on a baby blanket, but I am very close to finishing it now, I have about 23 rows left to do. Another couple of days and it will be finished. I cant wait as I want to do the same pattern in my own blend of colours so it will be interesting to see it in a mix of colours. I love experimenting with different colors. I don't think I've ever done one in the colors the pattern generally calls for. Post a picture when you're done! I love it the colors are really nice. I making a wrap. I am hoping I finish it this weekend. Are you making for yourself or a gift? I'd love to see a picture if you want to start a discussion when you're finished. hi ldyjarhead that sounds really pretty and I love the color combination too. I would love to crochet an afghan but cannot remember the pattern I used to use it was made in blocks and was so easy to do, would love 'to find it and start on a new afghan,each block had several colors of yarn in it. its a very common one but cannot think of the name of it to suit my soul. A granny square? I can't make them to save my life. hi lol I am not sure I can now either, its been so long, I just now remembered the name of them. they are really labor intensive as you have to not only crochet the squares then sew them together so dont know yet if I will do this or not. Yes, that looks better... What other colors would you use in this pattern? By "grape" I take it you mean some shade of purple? I think the black/grey/white combo would look very "classy". Yep, purple, but not real dark. The black/white/gray looked better than even I thought it would. I can't wait to finish these others so I can start that one. I'm more country/casual than modern/contemporary, but I think it will be a hit for the latter. That's really beautiful! I'm going to start making Christmas presents. I have enough used dryer sheets saved up to make a pillow for one of my sons and I'm going to try my hand at knitting. Dryer sheets for a pillow? Ok, you're going to have to explain that one. Throwing away dryer sheets just seemed so wasteful. So I started saving them and when I got a boxful, I noticed how nice and soft they were. I made my first pillow three years ago for a friend and she loved it. I sew some plain, sturdy material on 3 sides, put in the sheets I need then sew it up. Then I make a nice cover for it--sew on 3 sides and velcro the 4th side so it can be taken off and washed. It's a very cheap gift, especially if you can find some pretty remnants for the cover. I guess it takes about forty minutes of time and less than $2 of material and people just love them! That is great to hear. I am glad that you finally found something that suited you that you liked. I haven't been working on anything lately other than helping my mom and working online. I haven't had much time for anything else yet. It's such a simple pattern, I'm surprised I haven't found it before. I already have other colors I want to try. That's a HIT! I love it - so bright inspite of that dark brown - it kind of "grounds" the other 2 colors! Thanks. I do like it too, very vibrant, but it has to have something dark to set it off. I would have like a little more brown in ratio to the other two, but this particular pattern is only one row of each so they are the same. I've already started another with different colors, and have a third in mind too. What exactly is the pattern of the crochet? It is obviously not the same stitch (sorry, the cross stitcher in me) right down - and I really like it! Just single, double, treble crochet across the row. I wrote it out in the post above this one. With Christmas season soon approaching I am working on pillow dolls,coasters,bag holders,dollies,house shoes,throws,purses,hair accessories and many more gifts I hope to get done in time . Wow, you are a busy lady. Do you sell any of your items? Do you do craft fairs? Well I don't think I'd be able to teach you from myLot. There are lots of places online with instructions, though, some even with videos. I am doing the hand finish on a quilt for my son, this has taken me 3 years, because I was sick and couldn't work on it for a year. When I got well I couldn't seem to make up my mind on a color to back it with, I finally asked my daughter to pick one for me. Usually I can make up my mind, it's not easy not being able to do that. I hope I get back to doing that soon. I would love to quilt! I don't sew, but I do love looking at fabrics in the stores, isn't that odd? I've thought about buying some material that I could do a tie quilt with, but I'd still need a sewing machine to put it all together. I think a pretty fabric quilt tied with yarn would be fun. That's a cool pattern for those colors! I'm glad you settled on it. It's frustrating to try to find the perfect pattern, I know. I'm still working on the throw for my daughter and a pair of socks for myself. I didn't get anything done last week because of family things, but I'll get back on track now. I don't I'd ever be able to do socks. Too many needles and too much turning and all that. It's straight back and forth for me. I'd love to see pictures. I don't know about crocheting socks, although I've seen patterns for them, but I knit socks often. They're a small project and easy to carry around. I'll try to get some pictures on here both of the socks and the throw. That pattern is beautiful. Worth the trouble you went through to find it. As for what I'm working on...nothing right now LOL. We have a new baby coming in 3 weeks so I'm concentrating more on just getting organized rather than starting any new projects. Christmas is coming fast though so I'm sure it won't be long until I have to get moving on making gifts. Have a great day. LOL those have been done since shortly after I found out. OK I like that one as well, so which one did I like better? Can't deside lol. You need to teach methat one it looks really neat. Maybe I can do it without it turning out not staight. LOL my go in out in out. I hate counting. lol Your friend onlydia.